Next post: Weather isn’t news. We’re at ground zero of our 20 mile radius this week, with mince pies, sloe gin, knitting lessons from a 14th century logician. Let it snow, baby! I’ve got my love (and a new scarf) to keep me warm. 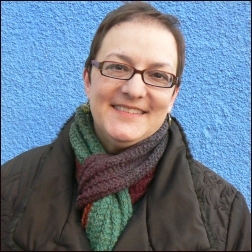 The polworth scarf was knit using Stephanie Pearl Mcphee’s (brilliant) One Row Scarf pattern. This weeks’ Audible Pick is The Little Stranger, by Sarah Waters, read by Simon Vance. Is there a way to keep a Scottish painting of Welsh knitters in the UK? Read the story, see the painting, and if you think you can help, please get in touch. Thanks. Craftlit is crossing the pond! Join Heather Ordover, Amy Singer (and me!) for a grand tour. Details here. Technical issues with the pattern for Driving Miss Daisy have been resolved. It will be available from the Krafti-Kit website from January 18th. My sincere apologies for any inconvenience this has caused. A new podcast for New Year’s Eve! What a nice surprise. This Fiber Artist Ice Hockey Fan will be cheering on the Chicago Blackhawks as they take on the New Jersey Devils on home ice tonight. I’ll also be working on my Nutkin sock, and listening to your podcast at some point. All of this with my sister visiting, and my husband flying home. A nice, quiet New Year’s Eve with loved ones, ice sports, and knitting. What more could one ask for? Hooray! Just the impetus I need for a good New Year’s Day hike. I found myself checking for a new podcast a lot lately–this was much needed. Thank you and have a wonderful evening! Hurrah! An episode of Cast-On to listen to whilst I wait for the classes to appear on the Knit Camp website. Lovely! A new episode to listen to on New Years Day! 🙂 What a good start for the year. Happy New Year to you and Tonya. I love your scarf btw – that really beautiful in it’s simplicity. Most likely I’ll end knitting something completely different though. Always turns out that way. Solaris by Berroco in Rowan Lima. Can’t wait to cast on!! I have knit this pattern before (with mods) in a crisper yarn (CVM) but cries to be made in Lima. The fit (with mods to front discussed in ravelry) is lovely, and it’s cozy without being unflattering. Brenda, this was a beautiful podcast to brighten the dark winter nights. I really enjoyed the essay regarding the scarf and the meaning and beauty of simplicity. Thank you for continuing on for your loyal listeners. Best wishes for health and happiness, with lots of knitting, in 2010! Thanks so much for helping me to bring in the new year today with this podcast. I do so look forward to each new episode and love your perspective on knitting and other things. I, too am on the cusp of the half century mark (only 5 months left of 40s!) and will share my husband’s oft repeated, but no less true response to my trepidation. “It beats the alternative.” Simple and accurate, if not comforting. Be well and happy in this new year! Regarding your sweater that fits nobody you know: Maybe you could sell it. It probably fits SOMEbody, and if you describe its size exactly and show how it fits you (or somebody else), maybe there’s a person out there it would just fit. Thanks again Brenda for another wonderful episode!!! Hope you have a wonderful year and a great selfish knitting month!! I also love the riding miss daisy pattern and will be ordering them!!! Dear Brenda, Thanks for another lovely podcast. Here’s a suggestion for the homeless sweater AND the old Welsh painting. Why not raffle off the sweater to raise money to keep the painting in Wales? 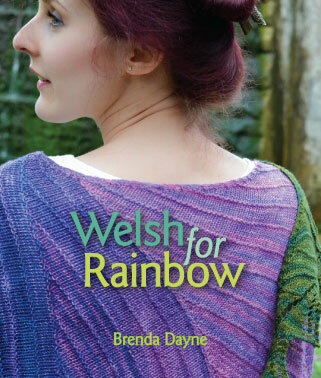 I’m sure that legions of knitters, myself included, would happily pay $1 or $5 or $10 for a chance to win an actual sweater that was HAND KNITTED BY BRENDA DAYNE whether it fit me or not! (Oh my gosh– the winner will be the envy of all her knitter friends! Can I have an extra raffle ticket for suggesting it?) You’ve built name recognition among knitters, my dear. Use it for a good cause! Another great podcast. I really do enjoy them, every single word! Thanks! I have, indeed, cast on a project for January. Having finished up a couple of selfish projects recently, I started earlier tonight a child’s sweater, which I’ll be sending on to my cousin stationed (again) in Afghanistan to give to a child there. “Winning hearts and minds” one stitch at a time, as it were. All the best to you in the coming year. I love to knit along and listen and I know I’m not the only one who never seems to have the right yarn and project at the same time. The music is just right too, and is always a nice touch. I’ve been knitting lots of hats for myself and family lately, but I feel it’s time for a sweater. I’ve been knitting over almost seven years now, and I feel that I’m finally ready for Jeana Wilson’s Rogue Sweater. I adore it, and I’ve had the pattern for a while now, and although I’ve probably had the skill set to make this a few years ago, I’ve just been putting it off until now. Now, to get some yarn. I’ll go stash diving first. Perhaps the convergence of perfect yarn in pattern is in my midst. As a suggestion for the sweater, I would give it to the local women’s shelter for abused women. I know the Seattle area’s DAWN network takes good quality clothing for their residents. Most shelters have a “shopping” area for women to go to for clothes needed for interviews or just to wear. These women often come with nothing but the clothes on their back. Your sweater will be sure to find a purpose there. I just found you in the podcast universe. I just can’t get enough! I love your format eventhough I am only into March of 2009. I wanted to comment on your voice (love it) which is very relaxing. Your format is lovely, I’ve learned so much in the few episodes I’ve listened to. The alchemy series is wonderful & has started a conversation between my 17 year old daughter & I. She is into chemistry & not knitting but we connected & she lit up when I said the word “alchemy”. Thank you for that little moment in our lives. My life feels a little more complete with your voice in it. I agree with Barbara Sarnecka. Use it for a good cause. If you don’t want to organise a raffle how about some kind of a silent auction? If proceeds don’t go to the painting how about one of the knitting charities like the Yarnharlot’s scheme (http://www.yarnharlot.ca/blog/tsffaq.html)? You could always donate it as a prize for that scheme? Seems since it is homeless twice it has a higher calling?! And quite simply thank you for your podcast. Just listened to your episode 89. Perhaps you could auction the Tilted Duster…..I’m not sure how….perhaps on Ebay….or through Ravelry? I’m sure some of your fans would vie for the chance to own/wear it. Then, you could donate the money to the fund to save the painting you spoke of. I don’t know….maybe a crazy idea. But it came to me while listening to you and so thought I should share. Oops. Looks like Barbara (see comment #14) beat me to the punch. Great minds must think alike! In addition to listening to Ep. 89, which was delightful, as usual, I am also listening to some of the past episodes that I find inspirational. In this case, #76, Panacea, and it is just a joy to listen to. You are brave, honest and true. I think your podcasting work, and it is work, is quite wonderful. 2009 must have been a year for sweater fails all around. I knitted two of that ilk myself. One with sleeves that are too tight, and one with a body that is too narrow. I see that I am with like-minded people in suggested raffling off the sweater and using proceeds for ?? ?homeless people who often don’t have the opportunity to wear nice warm sweaters? the painting? You choose, after all it is YOUR sweater! So happy to hear you podcasting again. I’m the one who flits from ‘new’ podcasts to the older ones, which, I have to say, I am rationing as I enjoy them sooo much. As a fellow American and long-time resident in the UK (since 1982) I also cannot believe how fast time flies and how at home I feel here now as well, although my heart is often in New York, with the rest of my family. And don’t worry about 50…bring it on…it is so liberating not to stress over all the little things anymore. xThanks again for your wonderful and treasured podcasts. Thank you for keeping me company as I drove to Vancouver on a cold, rainy day. I did have trouble keeping on the road when I found out about the Driving Miss Daisy gloves. I feel better now that I have bought them and will probably make them for my daughter’s Godmother who is Jessica Tandy’s niece. You and the podcast make my new year! I hope this is a wonderful, inspirational year for you and Tonya, and your family. Love the Driving Miss Daisy (gorgeous, as all your patterns seem to be), but apparently your supplier doesn’t ship to Australia, as I found when I went to their website and got half-way through the ordering process… Rats! I would love to support you and purchase this pattern – would you please let those of us Down Under know if and when they become available to us for purchase, please? Thank you very much. In the meantime, I wish you luck, joy and all the greatest knitting opportunities possible for the upcoming year. Wow, some things move really quickly – I went back to the Kraftikit site to show my sister the pattern and Australia is now on their shipping list. I feel a bit like Mr. Silly just now – but you have a wonderfully responsive supplier there – I sent them an email just a while ago about this. Fast work. I’ve had the yarn for it for two years, some lovely Black Water Abbey Tweed from Ireland in a natural Jacob color. As for the Tilted Jacket, I was going to suggest having your friend donate it to a shelter near her. I see others have had the same idea, but I also love the idea of raffling it off and donating proceeds to a good cause, maybe one the friend you gifted the sweater to supports. Love, love. love the cover of sweet child o’ mine. Hello, i am so excited to discover your podcast. Now as i tackle my new obsesion with knitting socks i can listen to you and know that theres someone out there who understands (my boyfriend is mystified by knitting, but likes the outcomes!) Can’t wait for the next one. When did it become an english tradition to listen to scary stories at christmas. Ive never heard that before and ive lived here all my life! As someone who is turn 50 in 2010(although a few months sooner than yourself) I am stoked about this coming year! I’m looking forward to being able to be more ME! Oh, I know there will still be problems and worries and stresses but I have decided that they will not rule my life. I’m spending quality time with my S.A.B.L.E., wheels and needles. I’m not going to miss an opportunity to be with family and friends. I am going to be very selective about who I invest myself in and be selfish about giving of my spirit, time and energy. And the one thing I am looking forward to this year is not feeling guilty about saying NO and meaning it. Congratulations on another excellent podcast and you upcoming birthday. May you have many more in the decades to come! Doris, as I understand it, the tradition of ghost stories at Christmas began (along with so many of our other holiday traditions) in the Victorian era, with Charles Dickens’s A Christmas Carol. Since then many others have followed in kind. M. R. James, a noted British medieval scholar, provost of King’s College, Cambridge and of Eton College, is best remembered for his ghost stories, many of which have been adapted for radio and television, and broadcast around the holidays. I first heard of the tradition during my first year in Wales, when the BBC re-ran its classic series, A Ghost Story for Christmas. The adaptation of M.R. James’s Whistle and I’ll Come to You is one of the scariest programs I’ve ever watched on telly! Thanks for mentioning Sticks N Stitches. 🙂 We’re really busy getting the finishing details together for this year’s event! However… I have to add a correction to something you said regarding Y2K where things would fall from the sky and computers fail causing the “greatest apocalypse the world has ever seen”…. Apocalypse (Greek: ?????????? Apokálypsis; “lifting of the veil” or “revelation”) is a term applied to the disclosure to certain privileged persons of something hidden from the majority of humankind. I also wanted to comment that I related to your “missed opportunity” story. Many would say.. “go with the flow” of life…. but I see these interferences as frustrating obstacles… trying to throw me off course.. I don’t understand them and I have had plenty of them in this past year and I am too perplexed and exhausted to even try anymore.. I know I sound negative.. but I have a lot of things I want to do.. things I want to go after, get involved with and I look at my life and realise I usually have to cut out more than I add back to my life… I can only hope my situation changes.. as I don’t want to end up looking back on a life full of missed opportunities and “What if”s.. and currently it feels that is where it is heading.. but I have very little energy…. I know .. the big thing I keep hearing is “Be in the moment”….. I am trying to desperately Be in the moment at the same time.. trying to move my life in a more productive happier direction and having the ability to take on new things and be involved etc…..
it feels hopeless for ME at this point.. But I wish you luck in your endeavors…. Caelidh, you word nerd! (I’m one too, actually.) Appropriate use of “apocalypse” duly noted. Thank you! Nothing is hopeless. I struggle with existential angst most of the time; I’m always wondering which path is the right one. It’s a problem for anyone who thinks deeply about the world and their own place in it. Pity it didn’t come with instructions. In addition to raffling off, or auctioning off, the Norah Gaughan sweater… if you *really* would like to wear it, can you take it apart and insert gussets along the side seams to make it wider? Then you’d also have to widen the sleeves to make them fit the enlarged armhole. It might work ! Regarding fave new sweater projects, I am obsessed with Kelmscott, at http://twistcollective.com/2009/winter/magazinepage_040.php — although it’s “fussier” than what I usually wear, I just love it. I have also been dying to make the Sunrise Circle Jacket by Kate Gilbert. Loved the podcast and thrilled to hear that the One-Row scarf was the solution. It has been my go-to solution SO many times over the past year. It looks awesome here. As to the too-small sweater — take measurements and pictures, post all and have a contest or a raffle so that some lucky can own a piece of “Cast On” wear in 2010. Thanks again for making my drive time wonderful, meditative, and provides excellent musical leads . . . as a matter of fact, after singing too loudly to Enter the Haggis for the zillionth time, my husband and I just recently went to see them when they came to MA. I wondered, as I sat in the audience, how many attendees came to them via Cast On . . .
Mocking people whose response to Y2K was , or to anything really–sure. Make fun of somebody intending to stockpile “in case of emergency” and ending up with what, two packs of soup and some dehydrated butter? Absolutely! But you seem to poo-pooh the idea of doing any preparedness at all, and I’m dismayed. Having a few gallons of potable water, some food, and working flashlights/torches on hand is just common sense. Every place has its own typical local disaster, be that tornado, flood, earthquake, or “ice storm and the occasional volcano”, and everybody is vulnerable to short-term infrastructure failure now and then. In November, Beaverton was under a boil-water advisory for a few days because of E.coli in the drinking supply. Beaverton! We have a couple of grocery sacks worth of good sturdy food in the cellar — peanut butter, crackers, canned chili, raisins, soy milk, and so on. To rotate the stock, twice a year I donate it to the local food bank and buy again. Pretty simple, and we’d be donating to them anyway. Thanks for another great podcast! I second (or third?) the idea that you raffle off the sweater to raise money to save the painting. Brilliant!!! You asked for stash-busting suggestions, and so here is my most recent obsession: Citron, designed by Hilary Smith Callis, published in Knitty Winter 09, http://www.knitty.com/ISSUEwinter09/PATTcitron.php. I have completed two of them so far and am ready to get another on the needles. It calls for one skein of malabrigo lace, which is about the equivalent of a healthy skein of sock yarn, of which I have about a closet-full. I envision myself having Citrons in every color, just like my sock collection! Brenda, it is always a pleasure for me to hear your delicious voice over the iPod. PS, Brenda, fifty is nifty. now you can play with the big girls!!! I just turned 50 on December 24. I didn’t seem to suffer from any of the angst my friends experienced when I turned 30 or 40, but there is something about being around for half a century that is stopping me in my tracks, especially when I received my invitation to join AARP in the mail a few weeks ago. I do have the advantage of looking to my mom for hope and inspiration. At 82, she is still working as an English as a second language teacher for the elementary schools and is attending a three day leadership conference with her colleagues this weekend. I think we need to readjust our thinking as to when middle age occurs. I like to think I’m not quite there yet (hah!). Thank you for all the wonderful hours of listening. I’ve been a listener since the very first podcast. 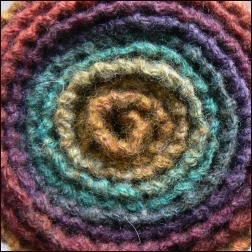 I’m listening now as I seam together Veronik Avery’s Oblique (Knitty.com). Brenda! I have the answer to the dishcloth/sponge problem! Not kidding! It’s a real catalog; I’ve ordered from there before. I also earburned you over at Ravelry so that all may know of this most glorious of finds. Could this be??? And I’m turning 40 next month. I hope this decade is better than my 30’s have been, to be honest. I have been searching for a new and different “stitch dictionary”. Looks like I found it. I am playing catch-up with all of your pod-casts while hiding from the gray Portland, OR sky. Looks just like the photo you just posted outside of your window! And yes, we do ship to Australia! “Noooorrrrrraaaaaahhhhhhh!” I love her too. Another great podcast. Thanks, as always, for what you do. I enjoyed your essay on Occum’s knitting. As my knitting gets more complex and I try new things, sometimes it is good to remember that simplicity is often as beautiful as the complex. 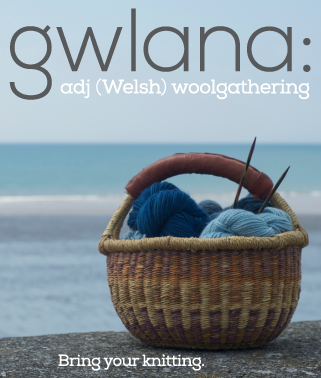 Hi listened to your podcast and was fascinated by your description of the original pattern you were going to knit the polwarth in, but couldnt catch the name. I loved the idea of quirky !! any help would be appreciated. Hi Charles, It’s spelled Lagenlook. My favorite label is OSKA. That scarf is TRULY gorgeous. I enjoyed this episode so much, partly because I haven’t heard anyone mention “Occam’s razor” since I was studying computer science. There is a parallel programming language named Occam, so that was the context. But, it is good to know that it applies to knitting, as well. I liked hearing about your sweater fails, and also the whole design process you went through with the handspun Polworth yarn. I go through these kinds of problems all the time, and feel like such a loser, sometimes. It’s good to know that other knitters go through this, as well. But when you are spinning and sometimes even dyeing the fiber yourself, it is not going to fit into just any pattern. It’s good to remember that. I’m so glad the sloe gin turned out well. What a great tradition! about your turning 50 this year. . . fear not. It’s not about accepting and wallowing in that. It’s accepting and reveling in that. Knowing who you are and expanding from there, learning new things, new adventures! i began learning to play the cello when i turned 50 and am learning Finnish and Italian, Your fifties can be a wonder adventure! enjoy!!! PS. I did wear a Tiara the entire day! I think that you could donate your knitting fail sweater to a women’s shelter or a charity thrift shop. Set it free to find someone whom it will fit and keep warm. I’m a relatively new listener and love your podcast. You inspire me, Brenda. You’re smart, articulate, funny, and thoughtful. Even when I don’t feel good, your ruminations and illuminations uplift me. Thank you. Lovely scarf, lovely podcast, lovely you! I just got back from my morning walk in suburban Cleveland, slip-sliding on frosty sidewalks and listening to all the talk of winter and scarves and colors. Thanks for another great one! Continue to enjoy your winter, and happy Selfish Knitting month! I’m thinking about the “Bird in Hand” mittens by Kate Gilbert, either now or for the knitting Olympics: http://www.kategilbert.com/ms_birdinhand.html. I’ve just recently turned 60. In the past 10 years I gone back to school and earned a master’s degree in library science and archival studies. I’ve made presentations at conferences all over the U.S., earned awards and scholarships, met brilliant and kind people, and learned so much and now work at a university library and archives part time. It’s true I don’t have the energy I had when I was younger, but I’ve learned to pace myself and use my time wisely. Next? I have a list of 100 things I want to do before I die. Whenever I cross one thing off, I add another. They include traveling to China, riding a roller coaster for the first time, and learning how to play the violin. I plan to die when I’m a 100 years old and I hope I still have 100 things left on my list when I do. Thanks for your podcasts, Brenda.